San Francisco: The Mitsubishi Lancer is a modest, compact four-door sedan that would be perfect for sending your daughter off to college in. Adding the word Evolution to the trunk lid badge changes the car completely. The Evolution, affectionately known as the Evo, is a super car designed for winning road rallies. It has long been revered in Japan for its road going prowess. Mitsubishi Racing has been around for 35 years, but we only got the Evo here in 2003. For 2006, the ninth iteration offers many worthwhile enhancements to make the car handle better and drive a little more comfortably. Horsepower got bumped slightly, and the power is available at lower rpm thanks to revised variable valve timing. They also performed some modest restyling to the front fascia and the lighting on both ends. My Electric Blue sample sat menacingly in my driveway, attracting my car-savvy 15-year-old neighbor, Peter. I took him out for a little run around the neighborhood. We zoomed up and down hills like a roller coaster and had a great time. While Pete�s eyes bugged out at the performance and the appearance of my test unit, my wife was less impressed. While this latest Evo has numerous improvements to make it a more comfortable daily driver, it is still a serious sports sedan, and you will feel the road surface and sense every turn in your guts. That can be exhilarating or exhausting, depending on your perspective. The heart of this super car is a modest 2.0-liter four-cylinder engine, but an intercooled, twin-scroll turbocharger makes all the difference, pushing output to 286 horsepower. The hood has prominent vents to let out the heat generated by this power-building process. The engine uses Mitsubishi Innovative Valve timing and Electronic Control (MIVEC) to provide maximum power across all parts of the rev band. The engine generates 289 lb-ft. of torque at 3500 rpm, which is a very large quantity in a compact sedan. There are three Evo models for 2006. My tester was the regular one, the IX, but there is also an RS model, which is the lightest and is geared for the racetrack. 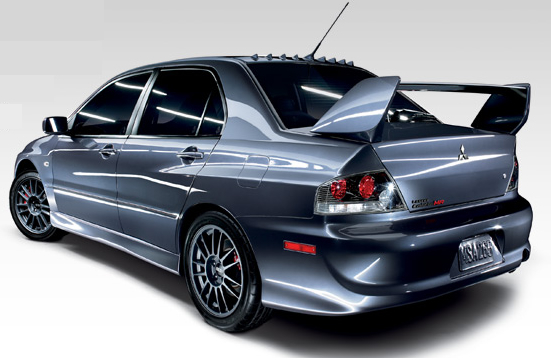 The MR model (it stands for Mitsubishi Racing) is the top dog, with numerous enhancements, including an aluminum roof (shared with the RS), specially-developed shocks, lightweight BBS alloy wheels, and a six-speed manual transmission. Inside, the MR gets an aluminum shift knob, aluminum and carbon fiber brake lever handle, and special red badging. All Evos benefit from the Active Center Differential (ACD) all-wheel-drive system, which helps put all that power to the road efficiently and safely. The ACD system uses a center differential to split torque up to 50/50 between the front and rear wheels. The car�s computer system uses sensor data to make instantaneous adjustments depending on driving conditions. The driver can select between three modes, Tarmac (dry road), Gravel (loose dirt), and Snow (wet & icy). As I was on dry roads for the entire test week I didn�t make any adjustments, but surely any rally driver would find this very useful. The Evo�s interior is a mixture of basic Japanese efficiency and ordinary materials on one hand and sports car equipment on the other. Sometimes, the Lancer�s humble origins become apparent, despite nice touches like the leather Recaro racing seats, metal pedals, and leather wheel and shift knob. But as soon as you put your foot into that right-hand pedal, all is forgotten in the whoosh of speed. You can grab a quick thrill on freeway onramps and hasty blasts away from the bridge tollbooth. I also visited some favorite back roads to sample the cars potential. You will see triple digit speeds without much effort on a straightaway, but as my course was winding, I had a chance to enjoy some absolutely flat cornering and level acceleration and deceleration. I didn�t take my wife on this trip.